I usually don’t post videos, but this one is really great. The producer has a mild way of introducing events surrounding the flood. He has a unique focus on Cain. Which brings a number of details into a new light with a lot of food for thought. Learning about the Pre-Flood WORLD is an important subject. This documentary covers multiple aspects with a unique outlook on Cain, the family he raised, and the impressions they left on this world. This video is new and unique in so many ways. I had to share it. We are trained to look at Revelation from an earthly view. Why? That is the only angle people have been taught to observe. Is there a view of Revelation we are missing? Of course there is. John was shown visions in Heaven. Everyone in Heaven understood each and every symbol and vision. No one in Heaven had any trouble understanding what John was shown. After every vision John had a bewildered look on his face. Revelation 12:1-6 NLTse (1) Then I witnessed in heaven an event of great significance. I saw a woman clothed with the sun, with the moon beneath her feet, and a crown of twelve stars on her head. (2) She was pregnant, and she cried out because of her labor pains and the agony of giving birth. (3) Then I witnessed in heaven another significant event. I saw a large red dragon with seven heads and ten horns, with seven crowns on his heads. (4) His tail swept away one-third of the stars in the sky, and he threw them to the earth. He stood in front of the woman as she was about to give birth, ready to devour her baby as soon as it was born. (5) She gave birth to a son who was to rule all nations with an iron rod. And her child was snatched away from the dragon and was caught up to God and to his throne. (6) And the woman fled into the wilderness, where God had prepared a place to care for her for 1,260 days. John made it very clear where this vision originated, in Heaven. There is no doubt about it, John saw that woman in Heaven. That shows a close connection the woman has to Heaven. Then John saw a huge red dragon in Heaven? What is a red dragon doing in Heaven? We have to remember where sin and the devil originated. Why is that important? If Heaven has to be reminded where sin originated, what about us? Angels not only witnessed the conflict between Christ and Satan, they were a part of that war in Heaven. They had to choose a side. There was no middle ground, no waiting around to see the outcome before choosing a side. Is this how Heaven views Christianity, “a woman clothed with the sun, with the moon beneath her feet, and a crown of twelve stars on her head.” First of all, why does Heaven view Christians as women? Some Christian denominations look at women as second class. Not many, but a few denominations. She is first of all clothed with the sun. It can’t be a real woman, it has to be a series of symbols. She is also standing on the moon. Why the moon? I’ve seen a lot of worldly views on those symbols. Preachers like to present this one like there is one interpretation, their interpretation and no other. But ask them where they got their interpretation from. John made it clear where that vision came from, and previous chapters not only told us where interpretations some from, but how scripture confirms each symbol. For one thing, why is the woman on the moon and not on earth? There has to be a reason for her position. Later she is fleeing to the wilderness, which is obviously on earth. Does that show us how the woman represents people who are not in this world, but close to it? What about the timing? First the woman is standing on the moon, clothed with the sun, then after giving birth, finds herself fleeing to a place God prepared for her in the wilderness. If the woman is clothed with the sun, it would be rather difficult to hide, especially at night. If we look at light and darkness in the simplest terms, we can see, the more light a Christian has, the harder it will be to hide. Or we can look at aspects from previous stories in Revelation related to the protection Jesus offered. The more light we have, the more we need to rely on His protection. When the light of the sun is on a dark planet, it will stand out. 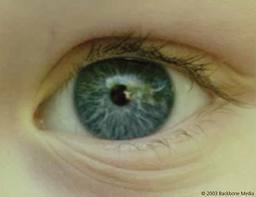 We can see that when we look at the physical aspects of the vision. Angels can see exactly where that woman is, and what she is doing. They can be there is an instant when she needs help, and does she need help. The woman also has twelve stars in a crown on top of her head. She is not set up to hide anywhere. The dragon has a third of the stars in the sky on his side. This is turning out to be a battle of light, and the woman seems to be out gunned. The woman gave birth to a son who was taken away from that dragon and brought up to God’s throne. Why was the child taken up and not the woman? Most Christians are rather good at looking at this vision and figuring out most of the symbols. The dragon is Satan. The woman represents God’s followers. The stars the dragon cast down to the earth are Satan’s followers, and the child is Christ. Now how does the Bible explain those symbols? When we look at women in the Bible, we have this woman and two others. The other women opposed God. The woman at the beginning of Revelation 12 has a few things in common with Jesus. She was clothed with the sun. In chapter 1, Jesus’ face shined like the sun. In Revelation chapter 10 we find an angel with a face like the sun. The woman had a crown with twelve stars. Jesus has seven stars in His right hand. Those stars represent seven angels sent to the churches. Now we are beginning to see how the Bible pieces things together. There are other stars. The stars the dragon cast to earth. Revelation chapter 6 told us about stars falling to earth. Are those the same stars? The timing doesn’t seem to align. Could the stars in chapter 6 be a reminder, or a warning of a concentrated attack by Satan’s followers? Chapter 10 told us about a star named bitterness that fell from the sky into the water making the water bitter. Other parts of that chapter shared the number one-third. We see how one-third of the trees and grass were burned. We can see how this war that began in Heaven was restricted to this world. Revelation chapter 9 gives us the key. A star was used to describe an angel who came to this world to open a bottomless pit and release a portion of Satan’s army. We know what stars represent in certain stories, angels. It has been confirmed twice in Revelation. Crown is another symbol used to identify the woman. In Revelation chapter 2, Jesus promised a crown of life to His faithful followers. In Revelation chapter 4 we are told the elders around God’s throne also have crowns. But Revelation chapter 9 tells us those locusts commanded by Satan also have crowns. There are two sides to the symbol. Because the woman’s child was taken to God’s throne in Heaven, we know the crown is used in the same context as those people who are close to God. 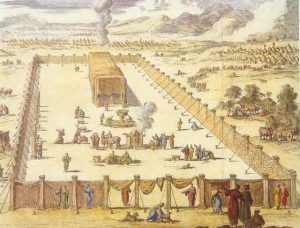 The Tabernacle, Temple, and Sanctuary: Revelation. eBook available here. That dragon also had seven crowns on his seven heads. Who is that dragon? This great dragon–the ancient serpent called the devil, or Satan, the one deceiving the whole world–was thrown down to the earth with all his angels. (Revelation 12:9 NLTse). This story clearly identified the dragon as Satan, the devil. The moon is another symbol to look at. In chapter 6 the sixth seal was opened and the moon became blood. That was the second reference to Revelation chapter 6 we found in chapter 12. A third of the stars and the moon turning to blood shed a little light on chapter 12. Would the woman still be standing on the moon when it turned to blood? Does a bloody moon indicate the beginning of the woman’s flight into the wilderness for 1,260 days? Are those stories related by more than the symbols they contain? The word, “then,” indicates a series of events. It shows how one event has to follow another. Did Jesus have to return to Heaven before Satan and his followers were restricted to this planet? It seems the war in Heaven didn’t happen until after Jesus died and returned to Heaven Did Heaven have to see Satan carry out all his plans before war could be declared? Did God have to wait until Satan provided undisputed proof how far he would go to obtain the power he lusted over? If we look at how the sequence was recorded, it would lead us to that conclusion. The story about Job and a few other stories in the Bible show us how Satan went back and forth between this world and God’s throne for a time. We have no idea, except for this sequence and a few other stories that help put a time line together. There had to be two events with the devil and his agents. First they were allowed access to this planet. 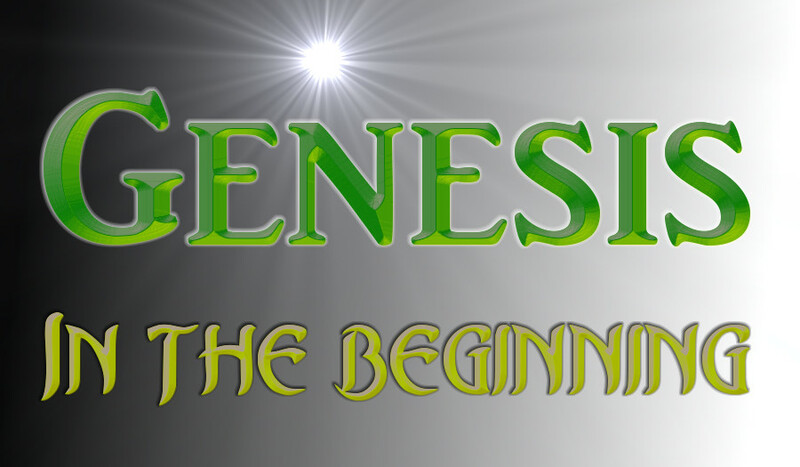 Genesis showed how Satan came to this planet and tempted Eve. Was Satan restricted to this planet at that time? Other stories in the Bible, like those in the Gospels, tell us about demons in this world. We know devils were on this planet at that time, but were they restricted to this planet? How long was Satan and his agents allowed to go between Heaven and earth? This vision supplied a lot more information. Satan and his angels used to accuse people in front of God’s throne 24 hours a day, 7 days a week. Judgment began at the end of Revelation chapter 11 and God’s Sanctuary was opened. Satan and his angels had to be cast of of Heaven and the Sanctuary before cleaning could begin. Some chapters in Revelation provide a series of events over a vast period of time, while other chapters provide a step by step process over a more specific time period. We have to be able to recognized time periods in Revelation and how some information overlaps. 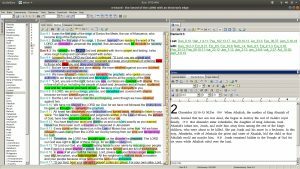 We see the same style of writing in Genesis where creation was explained, and later the author went back and added more details about the same event. That style of writing is common throughout the Bible. Some people criticize the Bible based on the fact, writers recorded some events in different orders. Biblical writers have a tendency of recording events in the order they happened, or are going to happen. But they still use the style of recording certain details after a certain event or story is introduced. Inspired writers do that to emphasize certain details. That’s why we have to read the previous story, so we can see the author’s view. 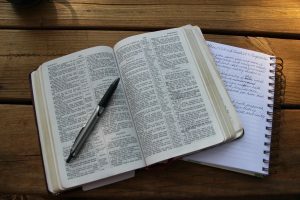 If the author had a reason for placing one story after a particular story, while another author used a completely different story to introduce the theme shows how God is willing to work with us where we are. Some events caught John’s attention more than they stood out in Matthew’s mind. When we have a book like that, the Spirit can present the same concepts, ideas, and lessons in a variety of ways to different people in different generations, or periods of time. Can you imagine a war in Heaven. Was it a real war with weapons? Were angels involved in hand to hand combat? Can you imagine that scene John saw? Huge angels fighting against one another. Where did the war take place, in the Sanctuary, or some remote battlefield? Is that war and battlefield described in the Bible? What was it like? Why didn’t John describe that war? Was it a violent war like we see on earth, or a word of words. Jesus was described as having a two edged sword in His mouth. Is that telling us it was a war of words? Looking back at the previous story we see judgment began in Heaven. The Ark containing the Ten Commandments was presented as evidence and was the center of attention. Who stood as a witness? What better place to begin judgment than at the origin of sin, Satan and his followers. 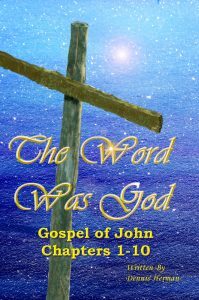 There is an interesting story in the Bible that helps explain the scene John witnessed. The LORD spoke to Moses after the death of Aaron’s two sons, who died after they entered the LORD’s presence and burned the wrong kind of fire before him. The LORD said to Moses, “Warn your brother, Aaron, not to enter the Most Holy Place behind the inner curtain whenever he chooses; if he does, he will die. For the Ark’s cover–the place of atonement–is there, and I myself am present in the cloud above the atonement cover. “When Aaron enters the sanctuary area, he must follow these instructions fully. He must bring a young bull for a sin offering and a ram for a burnt offering. He must put on his linen tunic and the linen undergarments worn next to his body. He must tie the linen sash around his waist and put the linen turban on his head. These are sacred garments, so he must bathe himself in water before he puts them on. Aaron must take from the community of Israel two male goats for a sin offering and a ram for a burnt offering. “Aaron will present his own bull as a sin offering to purify himself and his family, making them right with the LORD. Then he must take the two male goats and present them to the LORD at the entrance of the Tabernacle. He is to cast sacred lots to determine which goat will be reserved as an offering to the LORD and which will carry the sins of the people to the wilderness of Azazel. Aaron will then present as a sin offering the goat chosen by lot for the LORD. The other goat, the scapegoat chosen by lot to be sent away, will be kept alive, standing before the LORD. When it is sent away to Azazel in the wilderness, the people will be purified and made right with the LORD. “Aaron will present his own bull as a sin offering to purify himself and his family, making them right with the LORD. After he has slaughtered the bull as a sin offering, he will fill an incense burner with burning coals from the altar that stands before the LORD. Then he will take two handfuls of fragrant powdered incense and will carry the burner and the incense behind the inner curtain. There in the LORD’s presence he will put the incense on the burning coals so that a cloud of incense will rise over the Ark’s cover–the place of atonement–that rests on the Ark of the Covenant. If he follows these instructions, he will not die. Then he must take some of the blood of the bull, dip his finger in it, and sprinkle it on the east side of the atonement cover. He must sprinkle blood seven times with his finger in front of the atonement cover. “Then Aaron must slaughter the first goat as a sin offering for the people and carry its blood behind the inner curtain. There he will sprinkle the goat’s blood over the atonement cover and in front of it, just as he did with the bull’s blood. Through this process, he will purify the Most Holy Place, and he will do the same for the entire Tabernacle, because of the defiling sin and rebellion of the Israelites. No one else is allowed inside the Tabernacle when Aaron enters it for the purification ceremony in the Most Holy Place. No one may enter until he comes out again after purifying himself, his family, and all the congregation of Israel, making them right with the LORD. “Then Aaron will come out to purify the altar that stands before the LORD. He will do this by taking some of the blood from the bull and the goat and putting it on each of the horns of the altar. Then he must sprinkle the blood with his finger seven times over the altar. In this way, he will cleanse it from Israel’s defilement and make it holy. “When Aaron has finished purifying the Most Holy Place and the Tabernacle and the altar, he must present the live goat. He will lay both of his hands on the goat’s head and confess over it all the wickedness, rebellion, and sins of the people of Israel. In this way, he will transfer the people’s sins to the head of the goat. Then a man specially chosen for the task will drive the goat into the wilderness. As the goat goes into the wilderness, it will carry all the people’s sins upon itself into a desolate land. “When Aaron goes back into the Tabernacle, he must take off the linen garments he was wearing when he entered the Most Holy Place, and he must leave the garments there. Then he must bathe himself with water in a sacred place, put on his regular garments, and go out to sacrifice a burnt offering for himself and a burnt offering for the people. Through this process, he will purify himself and the people, making them right with the LORD. He must then burn all the fat of the sin offering on the altar. “The man chosen to drive the scapegoat into the wilderness of Azazel must wash his clothes and bathe himself in water. Then he may return to the camp. “The bull and the goat presented as sin offerings, whose blood Aaron takes into the Most Holy Place for the purification ceremony, will be carried outside the camp. The animals’ hides, internal organs, and dung are all to be burned. The man who burns them must wash his clothes and bathe himself in water before returning to the camp. “On the tenth day of the appointed month in early autumn, you must deny yourselves. Neither native-born Israelites nor foreigners living among you may do any kind of work. This is a permanent law for you. On that day offerings of purification will be made for you, and you will be purified in the LORD’s presence from all your sins. It will be a Sabbath day of complete rest for you, and you must deny yourselves. This is a permanent law for you. In future generations, the purification ceremony will be performed by the priest who has been anointed and ordained to serve as high priest in place of his ancestor Aaron. He will put on the holy linen garments and purify the Most Holy Place, the Tabernacle, the altar, the priests, and the entire congregation. This is a permanent law for you, to purify the people of Israel from their sins, making them right with the LORD once each year.” Moses followed all these instructions exactly as the LORD had commanded him. (Leviticus 16:1-34 NLTse). The high priest entered to Most Holy compartment where the Ark was only once a year. There were two goats involved in the ceremony. One goat was an offering to God. The other goat took on the sins of the people and was led into the wilderness. In Revelation chapter 12, the earth was referred to as a wilderness. Satan and his angels were cast down to this world. For Satan to be cast down to this world, there had to be a trial before God could sentence them to a life of isolation. When the judgment process began, Satan and his angels were first on the docket. Once they were removed from the courtroom, God could begin judging the dead. The Ark was front and center in the courtroom. Angels already saw what Satan did to Jesus. All of Heaven saw how Satan had Jesus beaten, wiped, and hung on a cross. Heaven saw how the high priest tried to force the decision on the government. Heaven saw how Jesus’ trial was fixed, and how every step was orchestrated. Now Heaven could see how God conducted a trial. Even though Heaven saw what Satan did to Jesus, God waited nearly 2000 years before calling Satan into His courtroom. There was never a trial in Heaven before. All God had to do was call His Son Jesus as a witness. As soon as Jesus stood in front of the Judge, and all the angels, Satan’s fate was sealed. Court records showed how Satan sinned in Heaven, attempted to murder Jesus many times, and finally succeeded. Satan had no defense. He had plenty of time to prepare a defense, but there was none. Evidence was overwhelming. Sins committed in Heaven were placed upon Satan and he was cast down to earth, never to see Heaven again. Now God could begin judging this world. First the dead, then the living. In the mean time, Satan’s fury was unleashed upon this world. Wars became deadlier. Men developed weapons no one imagined. Satan was given leeway to deal with this planet like never before. In one sense we call it the industrial revelation. In reality it is mankind learning more effective ways to kill one another. Revelation 12:13-18 NLTse (13) When the dragon realized that he had been thrown down to the earth, he pursued the woman who had given birth to the male child. (14) But she was given two wings like those of a great eagle so she could fly to the place prepared for her in the wilderness. There she would be cared for and protected from the dragon for a time, times, and half a time. 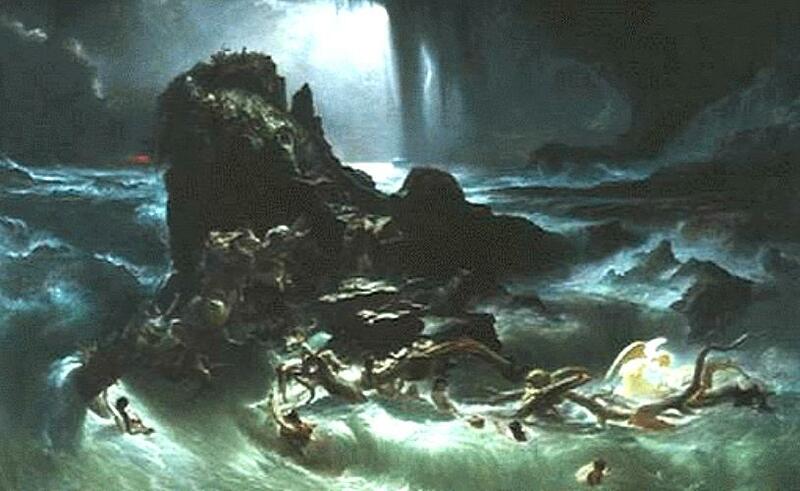 (15) Then the dragon tried to drown the woman with a flood of water that flowed from his mouth. (16) But the earth helped her by opening its mouth and swallowing the river that gushed out from the mouth of the dragon. (17) And the dragon was angry at the woman and declared war against the rest of her children–all who keep God’s commandments and maintain their testimony for Jesus. 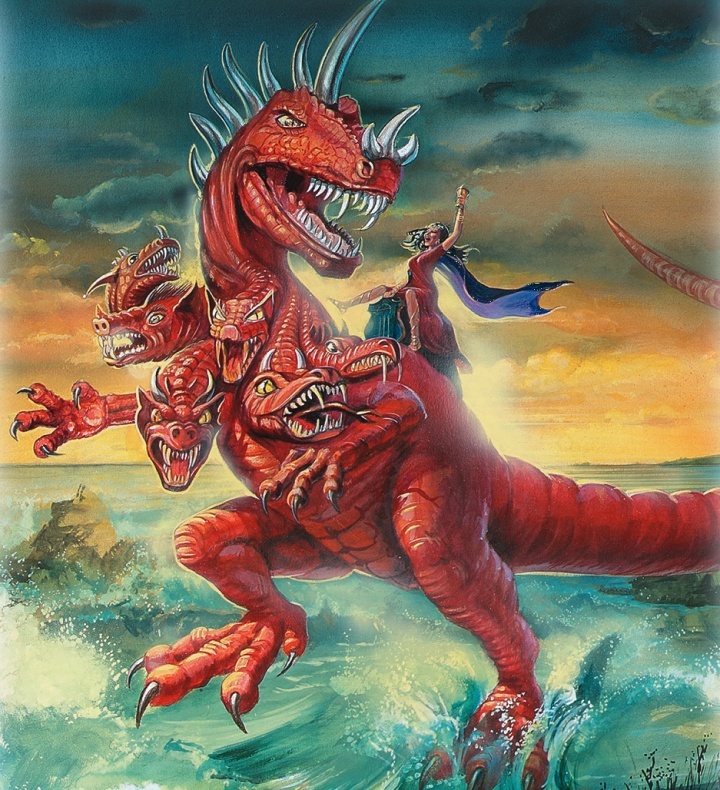 (18) Then the dragon took his stand on the shore beside the sea. Satan wasn’t happy about being restricted to this dismal planet. He wanted a lot more than this tiny planet to rule, he wanted the Universe. It took Satan some time to realize he lost the ability to travel between earth and Heaven. Satan wasn’t happy about loosing that ability. Satan lost a lot more. He began to loose the shine and light he had in Heaven. Satan was beginning to deteriorate, change, and face the consequences of sin like everything else in this world. Satan lost eternity and knew his time was short. When the dragon was let loose on the world, the woman was protected for a time, which is a time prophecy equal to 1260 years. This same time period is found in the previous chapter. And I will give power to my two witnesses, and they will be clothed in burlap and will prophesy during those 1,260 days.” (Revelation 11:3 NLTse). Are they the same time period? People trample the holy city for the same time period. But do not measure the outer courtyard, for it has been turned over to the nations. They will trample the holy city for 42 months. (Revelation 11:2 NLTse). In the next chapter we see a beast given authority for the same time period. Then the beast was allowed to speak great blasphemies against God. And he was given authority to do whatever he wanted for forty-two months. (Revelation 13:5 NLTse). Are all of these prophecies covering the same time period? If they aren’t, they either have to be literal days and months, if they were concurrent years, we have a long time to wait for Jesus. During those 1,260 years, Satan is running loose, trying to destroy the woman. The woman is hiding in the wilderness. God has two witness delivering a message or messages to this world most people don’t agree with. During that time nations trample the holy city, and a beast is given authority to do whatever it wants to do. If they are all pointing to the same time period, and persecution of that woman, she doesn’t stand much of a chance. The prophets have the ability to defend themselves. That may be why the woman is hiding and the message is still getting out. There are two classes of people or witnesses Satan has to deal with. God is not using one front to attack Satan, but hitting him from multiple sides. If anyone tries to harm them, fire flashes from their mouths and consumes their enemies. This is how anyone who tries to harm them must die. They have power to shut the sky so that no rain will fall for as long as they prophesy. And they have the power to turn the rivers and oceans into blood, and to strike the earth with every kind of plague as often as they wish. When they complete their testimony, the beast that comes up out of the bottomless pit will declare war against them, and he will conquer them and kill them. (Revelation 11:5-7 NLTse). The woman and the two prophets are protected from the beast and dragon for the same 1260 years Then the two prophets are killed and taken to Heaven. What happens to the woman after the witness go to Heaven and her protect period passes? The bottomless pit is opened after the fifth trumpet is blown. Four other angels are released and a 200 million man army showed up after the sixth trumpet was blown. Between the sixth and seventh trumpet, John is given a message to deliver, the holy city is overrun, the two prophets testify for 1260 years, and after that are killed. When the seventh trumpet is blown, the Heavenly Sanctuary is open, the Ark is seen inside, and judgment begins. After John saw the Sanctuary opened in Heaven, he was shown another vision taking him back over a time period of earth’s history that took place during the time of Jesus’ birth and life on earth. After Jesus’ death the woman was sent to the wilderness for 1260 years. Details that fit into the previous stories are given in Revelation chapter 12. Now all we have to do is figure out a few events on earth that happened after Jesus’ birth, or we should say the time between when John wrote Revelation and when the Sanctuary was opened in 1844 to find out how those prophecies were fulfilled. But I’m not going to do that. So many people did that already. I’m looking at a better understanding of Heaven, and pointing out how the Bible shows related stories. The main theme I am looking for is how Heaven viewed all those visions and symbols. After the devil faced trial in Heaven, God gave John and the angels a review of what the devil did. It is like we are seeing evidence presented during Satan’s trial. The woman was taken away on two wings. Angels have wings. Revelation explained how some beings in Heaven have wings. The dragon sent a flood out from his mouth. The mouth often refers to the war of words raging around us. Maybe the flood refers to the 200 million man army in Revelation chapter 9. They had horses with fire coming out of their mouths. “All who keep God’s commandments and maintain their testimony for Jesus.” It is clear the dragon declared war on everyone who sides with Jesus. Some refer to that as a church. The woman is identified by her children. “all who keep God’s commandments and maintain their testimony for Jesus.” They are people who follow Jesus, often referred to as a church in the loosest term. Some claim to be a type of remnant church, without knowing what that term means. If you look it up you’ll see how a remnant was no better than the other people who followed God to a limited degree. The majority of people were misled, but God stuck with them, and tried to teach them. Only a remnant, or small group heard God’s messages to one degree or another, and took steps to reestablish communication with God. The dragon took a stand on the shore beside the sea. The angel in Revelation chapter 10 had one foot on the land and the other on the sea. The devil has some control, but not as much control as Jesus. That may explain why stories about God’s remnant never seemed to completely return to God, but decided to make only a part of the journey. I seldom watch videos. You watch one video with one idea. The next has a totally different view. Especially when it comes to the Bible and history. When you combine history in the Bible, you have millions of different views. Bible dates and times should be easy to agree on. 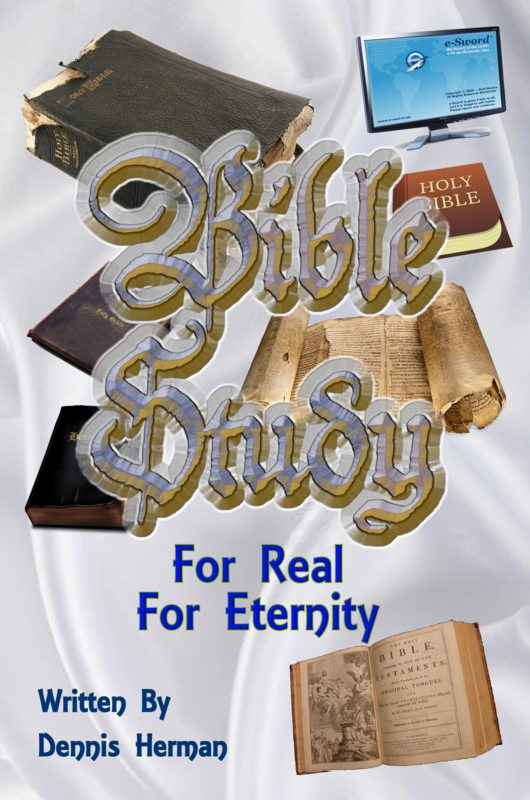 Bible dates and times are recorded in the most accurate and reliable source in the world. The Bible. But are those Bible dates and times accurate? And why do we need uninspired human sources to confirm the Bible? Especially the dates and time. It doesn’t make sense. And what sources are most reliable? I’m not sure. I did receive a copy of a study years ago I didn’t pay much attention to. It was full of numbers, dates, and such. Not along my line of interest. I didn’t give that a single thought until I ran across this video. This video on Bible dates and times it well done. It is food for thought. This video on Bible dates and times compares a few old manuscripts. I have read a little about those manuscripts and would agree with this video. There were good and poor copies of the Old Testament circulated around way before Jesus was born, and after His resurrection. This video on Bible dates and times is well worth a viewing. The story covers Jesus’ first visit to Jerusalem. The question is often asked why John was the only Apostle to record this event. John was the only Apostle to record what Jesus taught about the Holy Spirit. Not many people question those chapters. After reading this study, you should understand why John was the only Apostle to record Jesus’ first visit to Jerusalem. That first visit to Jerusalem was during the Festival of Shelters. Why did Jesus choose that time to go to Jerusalem? There is a spiritual reason behind it. John 7:1-53 NLTse After this, Jesus traveled around Galilee. He wanted to stay out of Judea, where the Jewish leaders were plotting his death. (2) But soon it was time for the Jewish Festival of Shelters, (3) and Jesus’ brothers said to him, “Leave here and go to Judea, where your followers can see your miracles! (4) You can’t become famous if you hide like this! If you can do such wonderful things, show yourself to the world!” (5) For even his brothers didn’t believe in him. (6) Jesus replied, “Now is not the right time for me to go, but you can go anytime. (7) The world can’t hate you, but it does hate me because I accuse it of doing evil. (8) You go on. I’m not going to this festival, because my time has not yet come.” (9) After saying these things, Jesus remained in Galilee. 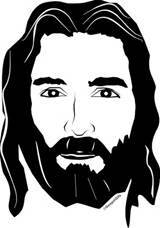 (10) But after his brothers left for the festival, Jesus also went, though secretly, staying out of public view. (11) The Jewish leaders tried to find him at the festival and kept asking if anyone had seen him. (12) There was a lot of grumbling about him among the crowds. Some argued, “He’s a good man,” but others said, “He’s nothing but a fraud who deceives the people.” (13) But no one had the courage to speak favorably about him in public, for they were afraid of getting in trouble with the Jewish leaders. (14) Then, midway through the festival, Jesus went up to the Temple and began to teach. (15) The people were surprised when they heard him. “How does he know so much when he hasn’t been trained?” they asked. (16) So Jesus told them, “My message is not my own; it comes from God who sent me. (17) Anyone who wants to do the will of God will know whether my teaching is from God or is merely my own. (18) Those who speak for themselves want glory only for themselves, but a person who seeks to honor the one who sent him speaks truth, not lies. (19) Moses gave you the law, but none of you obeys it! In fact, you are trying to kill me.” (20) The crowd replied, “You’re demon possessed! Who’s trying to kill you?” (21) Jesus replied, “I did one miracle on the Sabbath, and you were amazed. (22) But you work on the Sabbath, too, when you obey Moses’ law of circumcision. (Actually, this tradition of circumcision began with the patriarchs, long before the law of Moses.) (23) For if the correct time for circumcising your son falls on the Sabbath, you go ahead and do it so as not to break the law of Moses. So why should you be angry with me for healing a man on the Sabbath? (24) Look beneath the surface so you can judge correctly.” (25) Some of the people who lived in Jerusalem started to ask each other, “Isn’t this the man they are trying to kill? (26) But here he is, speaking in public, and they say nothing to him. Could our leaders possibly believe that he is the Messiah? (27) But how could he be? For we know where this man comes from. When the Messiah comes, he will simply appear; no one will know where he comes from.” (28) While Jesus was teaching in the Temple, he called out, “Yes, you know me, and you know where I come from. But I’m not here on my own. The one who sent me is true, and you don’t know him. (29) But I know him because I come from him, and he sent me to you.” (30) Then the leaders tried to arrest him; but no one laid a hand on him, because his time had not yet come. (31) Many among the crowds at the Temple believed in him. “After all,” they said, “would you expect the Messiah to do more miraculous signs than this man has done?” (32) When the Pharisees heard that the crowds were whispering such things, they and the leading priests sent Temple guards to arrest Jesus. (33) But Jesus told them, “I will be with you only a little longer. Then I will return to the one who sent me. (34) You will search for me but not find me. And you cannot go where I am going.” (35) The Jewish leaders were puzzled by this statement. “Where is he planning to go?” they asked. “Is he thinking of leaving the country and going to the Jews in other lands? Maybe he will even teach the Greeks! (36) What does he mean when he says, ‘You will search for me but not find me,’ and ‘You cannot go where I am going’?” (37) On the last day, the climax of the festival, Jesus stood and shouted to the crowds, “Anyone who is thirsty may come to me! (38) Anyone who believes in me may come and drink! For the Scriptures declare, ‘Rivers of living water will flow from his heart. '” (39) (When he said “living water,” he was speaking of the Spirit, who would be given to everyone believing in him. But the Spirit had not yet been given, because Jesus had not yet entered into his glory.) (40) When the crowds heard him say this, some of them declared, “Surely this man is the Prophet we’ve been expecting.” (41) Others said, “He is the Messiah.” Still others said, “But he can’t be! Will the Messiah come from Galilee? (42) For the Scriptures clearly state that the Messiah will be born of the royal line of David, in Bethlehem, the village where King David was born.” (43) So the crowd was divided about him. (44) Some even wanted him arrested, but no one laid a hand on him. (45) When the Temple guards returned without having arrested Jesus, the leading priests and Pharisees demanded, “Why didn’t you bring him in?” (46) “We have never heard anyone speak like this!” the guards responded. (47) “Have you been led astray, too?” the Pharisees mocked. (48) “Is there a single one of us rulers or Pharisees who believes in him? (49) This foolish crowd follows him, but they are ignorant of the law. God’s curse is on them!” (50) Then Nicodemus, the leader who had met with Jesus earlier, spoke up. (51) “Is it legal to convict a man before he is given a hearing?” he asked. (52) They replied, “Are you from Galilee, too? Search the Scriptures and see for yourself–no prophet ever comes from Galilee!” (53) Then the meeting broke up, and everybody went home. Indecision. That word sums up this chapter as well as the last chapter. Why? Why couldn’t people accept what Jesus was saying? Is it really that much different today? People read the Bible. And people seem to disagree on just about every subject, including the meaning of Jesus’ resurrection. Jesus has been slowly introducing the subject of resurrection one little detail at a time. Search the scriptures is not repeated in this chapter for nothing. Jesus sent people to scriptures. Did they refer to them? Did they see details we’ve seen? Was this another lesson showing how some people read God’s Word one way while other people say it means something totally different, or the opposite? How do we know which it true? The one thing we never want to do is separate a few verses out of a chapter and try to explain what it means. That is like leaving God’s hand, or leaving His Spirit behind like those people in the previous chapter left Jesus behind. John 7:1-9 NLTse After this, Jesus traveled around Galilee. He wanted to stay out of Judea, where the Jewish leaders were plotting his death. (2) But soon it was time for the Jewish Festival of Shelters, (3) and Jesus’ brothers said to him, “Leave here and go to Judea, where your followers can see your miracles! (4) You can’t become famous if you hide like this! If you can do such wonderful things, show yourself to the world!” (5) For even his brothers didn’t believe in him. (6) Jesus replied, “Now is not the right time for me to go, but you can go anytime. (7) The world can’t hate you, but it does hate me because I accuse it of doing evil. (8) You go on. I’m not going to this festival, because my time has not yet come.” (9) After saying these things, Jesus remained in Galilee. Jesus went back to his hometown. The town He grew up. Jesus needed to stay away from those religious leaders. Out of their cross hairs. They were hunting Jesus because they wanted to kill Him. Another Jewish festival came up. It was the Festival of Shelters. It used to be a simple ceremony when Hebrews lived in temporary shelters for a time. This was to remind them, this world is temporary and one day God would come to take them to the real promised land. The promised land we refer to as the spiritual promised land. “Remember that this seven-day festival to the LORD–the Festival of Shelters–begins on the fifteenth day of the appointed month, after you have harvested all the produce of the land. The first day and the eighth day of the festival will be days of complete rest. On the first day gather branches from magnificent trees–palm fronds, boughs from leafy trees, and willows that grow by the streams. Then celebrate with joy before the LORD your God for seven days. You must observe this festival to the LORD for seven days every year. This is a permanent law for you, and it must be observed in the appointed month from generation to generation. For seven days you must live outside in little shelters. All native-born Israelites must live in shelters. This will remind each new generation of Israelites that I made their ancestors live in shelters when I rescued them from the land of Egypt. I am the LORD your God.” So Moses gave the Israelites these instructions regarding the annual festivals of the LORD. (Leviticus 23:39-44 NLTse). All that changed when Solomon decided to dedicate his temple during that festival. It seems like an oxymoron, putting God into a stone temple during a festival when Israel, including the king was supposed to move into a temporary shelter made of sticks and leaves. A new tradition was born and people loved it. No more camping out every year. People replaced God’s festival with one of their own. An easier one to keep. But the vision of Heaven was lost. How could that happen? If you check back a few chapters before Solomon dedicated his temple, you’ll find Solomon appointed the priests and other religious leaders. The king controlled the church. You’ll also find, David did the same thing. We can’t tell how much of an effect that had on religious services, but we can see how later kings appointed pagan priests, religions, and introduced idols. For generations that temple bounced around from a pagan temple, back to Hebrew, and back and forth. Every change resulted in a blend of pagan traditions and what was left from the instructions Moses recorded. Jesus had His work cut out for Himself. This is why His work was so difficult. The religion those Jews followed was hardly a shadow of what Moses and Aaron followed and taught in the wilderness. The symbols used in the Tabernacle were also lost. Little if anything in the stone temple pointed to Jesus. Herod’s temple was based on a grand and glorious design aimed at showing the world God’s greatness. The meekness and simplicity of Christ was gone. Even the sacrificial system had been so distorted, no one had any idea there was a connection between the lamb and Christ. The system was so broken, God’s plan was to start from scratch by introducing new symbols. But was the world ready for the change? Jesus’ brothers summed up what the world wanted to see and understand about Jesus. All they cared about was His miracles. It’s pretty much the same today. Go to a church with a prayer and praise portion in their service. What do you hear? People asking prayer for this, that or the other thing. Does anyone praise God? Does anyone stand up to tell what God taught them that week? Not too often. For the most part, the few minutes is filled with people asking for things – asking God to prove Himself with another miracle. Business was good in Galilee. People were making money selling lodging, food, water, and care for travelers animals. Believe it or not, Jesus’ ministry became a windfall for every business in Galilee. His brothers didn’t want Jesus sitting around. They wanted Him to go out and do some advertising to bring in more business. What better place to advertise than Jerusalem during a major festival. All Jesus could tell them is, it wasn’t His time. Time for what? Most people look at the surface and think it wasn’t His time to go to Jerusalem to die. Although that may be true, it is far from the whole story. Jesus had to give God’s Spirit a little more time to set up details so some people would actually listen and understand. The best Jesus could hope for was a few people to listen and understand. Jesus knew the message He had to deliver would aggravate a lot of people. The message would aggravate a lot more if He moved too quickly. We see how Jesus repeated the phrase about not being the right time. Jesus called it His time. When the time was right, it would be Jesus’ time to teach and continue His ministry. Everything had to be done on time, according to God’s plan, and according to every prophecy recorded about Himself. This was a vital key to Jesus’ success. One of the major conditions of Jesus’ ministry was to point people to the prophecies He was fulfilling, when He was fulfilling them. This is also a vital part of Christianity today, but a sadly neglected major portion of the ministry and message Jesus gave to take to the world. John 7:10-13 NLTse But after his brothers left for the festival, Jesus also went, though secretly, staying out of public view. (11) The Jewish leaders tried to find him at the festival and kept asking if anyone had seen him. (12) There was a lot of grumbling about him among the crowds. Some argued, “He’s a good man,” but others said, “He’s nothing but a fraud who deceives the people.” (13) But no one had the courage to speak favorably about him in public, for they were afraid of getting in trouble with the Jewish leaders. First Jesus told His brothers it wasn’t His time. About three days later, Jesus went to Jerusalem. Why did His brothers leave halfway through the festival? That shows how seriously they treated the festival and how much it had been changed. Why did Jesus wait for His brothers to leave before going to the festival? The obvious answer would be, He didn’t need their advise or influence. Jesus also didn’t need them asking for more miracles in front of the crowds, or using Jesus’ influence to get more people to visit Galilee. The influence in Galilee didn’t paint a proper picture of Jesus. Jewish leaders were looking all over for Jesus. They expected Him to visit Jerusalem during the festival. It wouldn’t be a big deal for them to arrest Jesus during the Festival of Shelters. Jesus didn’t have the large following He did at the end of His ministry. John told us how people were leaving Jesus. We can assume reports to the priests were greatly exaggerated. Walking among the crowds showed those Jewish leaders how split Jews were when the talked about Jesus. As we know, little attention is paid to anyone supporting someone you despise, while the emphasis is placed on people agreeing with your view. It didn’t matter what the actual numbers were, the priests looked at any indicator in their favor as a victory. Numbers didn’t matter to God either. Of course He wanted everyone to turn to His Son and be saved, but human numbers would not be of any consequence to any part of God’s plan. It never was and it never will be. God’s Spirit told Jesus when the time was right to go to Jerusalem. God had to make sure everything was prepared. Just before Jesus entered Jerusalem, He saw a few temporary shelters constructed outside the city gates. He stood and watched people pass those shelters and listened to them. People didn’t recognize Jesus. He was hidden from them like the message those shelters carried. People passed those shelters without giving them a though. A few people hurled insults and some threw a few stones. Some of those shelters housed only individuals while others housed an entire family for a week, So many people passed them thinking it was some sort of long lost religious cult. Others thought it was some kind of misled movement. A few people stopped to ask why they chose to honor God’s festival this way. Those inside were more than happy to explain, and point them back to scripture. That was the only way people could see the message in the pattern. Passover, to harvest, to trumpets and atonement, then finally the shelters. Jesus watched those people for some time. Then He went from shelter to shelter to listen to them and share a few words. Once inside the city gates, Jesus only saw a few more shelters. He stopped and talked to them on His way to the temple. A few people followed Him to the temple, but not many. Mostly they were people curious about those shelters. Something inside told them there was much more to learn about those shelters and Jesus seemed to know more than anyone they’ve ever met. Once inside the temple court, Jesus and the few people following Him could see how the Jews celebrated the Festival of Shelters. What a contrast to those few people outside the city gates. People were busy exchanging money, buying lambs, goats, and birds, then standing in another line to have them sacrificed. It was clear all those animals were being sacrificed to honor the temple. The sudden impact of reality made people think and wonder how things could have changed. Jesus knew how. The Festival of Shelters does more than serve as a reminder this life is temporary. It is also one illustration showing how people pick and choose which parts of the Bible to accept and which to reject. The festival also showed how easy it is for religious leaders to hide scripture from people to get their way. Jews concentrated on one part of scripture while hiding another. “Five days later, on the fifteenth day of the same month, you must call another holy assembly of all the people, and you may do no ordinary work on that day. It is the beginning of the Festival of Shelters, a seven-day festival to the LORD. On the first day of the festival, you must present a burnt offering as a special gift, a pleasing aroma to the LORD. It will consist of thirteen young bulls, two rams, and fourteen one-year-old male lambs, all with no defects. Each of these offerings must be accompanied by a grain offering of choice flour moistened with olive oil–six quarts for each of the thirteen bulls, four quarts for each of the two rams, and two quarts for each of the fourteen lambs. You must also sacrifice a male goat as a sin offering, in addition to the regular burnt offering with its accompanying grain offering and liquid offering. “On the second day of this seven-day festival, sacrifice twelve young bulls, two rams, and fourteen one-year-old male lambs, all with no defects. Each of these offerings of bulls, rams, and lambs must be accompanied by its prescribed grain offering and liquid offering. You must also sacrifice a male goat as a sin offering, in addition to the regular burnt offering with its accompanying grain offering and liquid offering. (Numbers 29:12-19 NLTse). The Jewish leaders emphasized one description of the festival while hiding the other. Tradition turned the festival into an endless stream of sacrifices to honor the temple. They had no evidence to prove God existed inside the temple. That was all the more reason to combine the long list of sacrifices on the Festival of Shelters with Solomon’s dedication of his temple when he sacrificed so many animals, blood ran into the streets like a river. The more sacrifices, the more money the priests made. Another well hidden scripture is found in Isaiah. Listen to the LORD, you leaders of “Sodom.” Listen to the law of our God, people of “Gomorrah.” “What makes you think I want all your sacrifices?” says the LORD. “I am sick of your burnt offerings of rams and the fat of fattened cattle. I get no pleasure from the blood of bulls and lambs and goats. When you come to worship me, who asked you to parade through my courts with all your ceremony? Stop bringing me your meaningless gifts; the incense of your offerings disgusts me! As for your celebrations of the new moon and the Sabbath and your special days for fasting– they are all sinful and false. I want no more of your pious meetings. I hate your new moon celebrations and your annual festivals. They are a burden to me. I cannot stand them! When you lift up your hands in prayer, I will not look. Though you offer many prayers, I will not listen, for your hands are covered with the blood of innocent victims. Wash yourselves and be clean! Get your sins out of my sight. Give up your evil ways. Learn to do good. Seek justice. Help the oppressed. Defend the cause of orphans. Fight for the rights of widows. “Come now, let’s settle this,” says the LORD. “Though your sins are like scarlet, I will make them as white as snow. Though they are red like crimson, I will make them as white as wool. If you will only obey me, you will have plenty to eat. (Isaiah 1:10-19 NLTse). The Festival of Shelters showed how religious leaders separate and segregate certain parts of scripture to benefit themselves and their beliefs. In the example of the Shelters, one section pointed to God’s prophets. The other was used to only point to profits. How was Jesus going to get them to look at all of God’s Scripture so they could see the truth for themselves? At first the people were surprised at what Jesus taught. They heard much of what He had to say for the first time and were amazed at how simple it was, and how much they missed. “How does he know so much when he hasn’t been trained?” they asked. Everything was going great until Jesus mentioned the law. “My message is not my own; it comes from God who sent me. Anyone who wants to do the will of God will know whether my teaching is from God or is merely my own.” The message Jesus refereed to was not something new, but scripture recorded generations before He came to this world. Jesus pointed them back to scripture. He didn’t need to prove Himself. Everything He taught came from scripture, a full view of scripture. “Those who speak for themselves want glory only for themselves, but a person who seeks to honor the one who sent him speaks truth, not lies.” People speak for themselves by taking little bits and pieces of scripture then telling people what they think it means. They don’t back it up with scripture, nor do they allow scripture to explain itself. They rely on themselves to glorify themselves. “Moses gave you the law, but none of you obeys it! In fact, you are trying to kill me.” Jesus pointed them back to scripture. In particular, everything Moses wrote about the festival they were celebrating. It was time to put away man made traditions and look at what God gave them. It was time to put aside man made interpretations for the symbols and learn how scripture revealed the spiritual meaning for every symbol. People didn’t like Jesus bringing up the subject of the law that had been twisted and remolded by men to become a burden people would just as soon avoid. Their reaction showed their distorted concept of the law. The crowd replied, “You’re demon possessed! Who’s trying to kill you?” More often than not, people will attack someone they don’t agree with by changing the subject. After listening to Jesus for a while, they all knew, they wouldn’t stand a chance debating the law with Jesus. They could see He understood a lot more than they did. So they accused Jesus of being possessed by a demon. Did that every happen to you? It happens to me all the time. If you engage in online discussions about the Bible, it doesn’t matter what subject is being discussed. Chances are the group consists of one or two people who want to appear like they know everything. They feel threatened by anyone who introduces material they don’t know about. If they feel out matched in scripture, they change the subject by accusing you of being possessed, or a false prophet, a member of a church they consider an enemy, or something along those lines. This is what happened to Jesus. It’s not hard to see who changed the subject. Jesus went right into an example showing how they chose one part of the law over another, and in His own way, asked them how to explain it. With the same question, Jesus asked them to explain why it was okay for them to circumcise a baby, but it was wrong for Jesus to heal an old man or woman on the Sabbath. When Jesus told them to, “Look beneath the surface so you can judge correctly.” He pointed them back to scripture. Not to read it by themselves, but with God’s Spirit who could explain everything below the surface. This showed how people can be misled when they decide to take the easy way out and let someone read and interpret scripture for them. This brings us to the worldly concept based on reliance upon gifted worldly leaders. We can see this was a problem in Jesus’ day. They were taught the wrong concept on the Festival of Shelters. God used this to introduce a lesson which expanded in verses 26 and 27 to include views on the Messiah. Once again we see how the subject is changed to avoid the subject at hand. Now we can see why Jesus had to keep repeating Himself in the previous chapter. The same pattern kept occurring here. Jesus was trying to teach one subject, but people who felt threatened kept changing the subject. Jesus had to repeat Himself to get them back on the lesson at hand. The enemy uses the same pattern today. Religious leaders shared only what they wanted people to hear. Those religious leaders knew how Herod’s priests told him the Messiah was born in Bethlehem. But after Herod verified the Messiah’s birth by killing every child in Bethlehem, they needed to hide other scripture, another detail about the Messiah. Call it a political cover up or a conspiracy. Those priests were working with Herod to cover up a massacre. Something that never should have happened. But God wouldn’t allow it to be covered up. People still talk about it today. Most just can’t see all the spiritual implications. Talk about secrets being shouted from roof tops. Jesus didn’t enter into another debate on scripture. He told them where they needed to go by telling them where He came from. “Yes, you know me, and you know where I come from. But I’m not here on my own. The one who sent me is true, and you don’t know him. But I know him because I come from him, and he sent me to you.” But did those people really know Jesus? He wasn’t about to argue with Him. Jesus knew they could only go so far to criticize Him. They were restricted by their reliance on the money flowing into Galilee from people visiting Jesus’ hometown. We see a parallel between those religious leaders and the people who grew up with Jesus. Both were profiting from the Messiah but couldn’t see the real Messiah in front of them. As soon as the priest’s saw Jesus gaining an advantage, they tried to arrest Him. When it looked like people were leaving Jesus, the priests didn’t think they had much to worry about. But once they looked a little deeper, they saw the number of Jesus’ followers beginning to increase in front of their eyes. The priests wavered to say the least. But once they made their move, they reached a point of no return. People believed in Jesus’ miracles and those priests couldn’t deny them. They tried to deny the miracles but that and it didn’t work. Jesus was trying to teach the people what the priests couldn’t see. Jesus was trying to teach how to understand how God’s Spirit worked and how to properly understand scripture. Jesus wanted more than a bunch of people following Him around to see miracles. 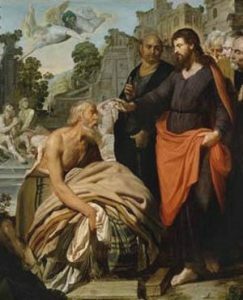 Jesus wanted more than people looking for physical healing. Jesus wanted to spiritually heal them. Jesus introduced a new subject in the from of a parable. That parable was also a prophecy because it hadn’t taken place yet. Jesus told them, “I will be with you only a little longer. Then I will return to the one who sent me. You will search for me but not find me. And you cannot go where I am going.” We know Jesus was talking about His resurrection, but the Jews had no way of knowing what He was talking about. They didn’t know because they didn’t study scripture. They wouldn’t allow God’s Spirit to lead. People today are still confused. Jesus wasn’t referring to people physically looking for Him. 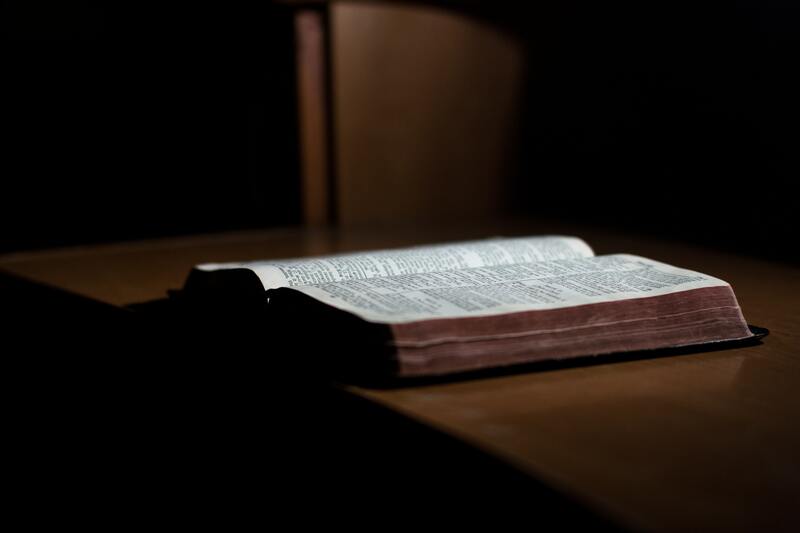 Jesus referred to searching scripture. Jesus wasn’t using miracles to prove who He was. What was written in scripture should have been proof enough. It should be proof enough today. But how many people have the ability to open scripture and prove Jesus is the Messiah from the prophecies? Those priests had the opportunity to either prove or disprove Jesus’ claims with scripture. They had years to search scripture for an answer. But their pride kept them from opening God’s Word. Ambition kept those priests from accepting guidance from God’s Spirit. What’s your excuse? Jesus didn’t introduce a new subject to the previous conversion but introduced this subject on another day. Jesus left those religious leaders wondering where He was going and why they couldn’t follow Him. Jesus told them to search scripture. Which brings us to our next subject. Jesus quoted scripture, but I can’t find where He quoted this from. ‘Rivers of living water will flow from his heart.” There are a few possibilities, but I can’t find an exact quote or anything that stays within the complete context of this chapter. Maybe that was done by design. What could be better than sending people back to scripture with a verse that requires them to examine a dozen or more texts to find a match. I wonder how many people looked for what scripture Jesus quoted and found lessons they hadn’t expected. Even though the particular texts Jesus referred to can’t be located, something Jesus told them impressed the crowd. When the crowds heard him say this, some of them declared, “Surely this man is the Prophet we’ve been expecting.” Did the crowd that day finally make the connection Jesus was using living water to symbolize? Many people think living water refers to Jesus. Is there scripture proving that? John tells us living water points to the Spirit just as Isaiah wrote. “For I will pour out water to quench your thirst and to irrigate your parched fields. And I will pour out my Spirit on your descendants, and my blessing on your children.” (Isaiah 44:3 NLTse). John 7:41-44 NLTse Others said, “He is the Messiah.” Still others said, “But he can’t be! Will the Messiah come from Galilee? (42) For the Scriptures clearly state that the Messiah will be born of the royal line of David, in Bethlehem, the village where King David was born.” (43) So the crowd was divided about him. (44) Some even wanted him arrested, but no one laid a hand on him. John didn’t record a mistake, nor a contradiction. We have to look at who said what. In this meeting, people said, “the Scriptures clearly state that the Messiah will be born of the royal line of David, in Bethlehem, the village where King David was born.” Earlier in this chapter someone else said, “When the Messiah comes, he will simply appear; no one will know where he comes from.” Look at the context of this conversion. Others said, “He is the Messiah.” Still others said, “But he can’t be! Will the Messiah come from Galilee?” John is showing us the confusion Jesus had to face. We have to remember, much of John’s book centers on showing us methods Jesus used to reach out to people. John has been adding another important lesson, the confusion Jesus faced. Don’t we all face a bit of confusion when we spread the word, share what we know about Jesus, and try to lead people to Christ? We have an advantage. Most of the world has already heard about Jesus. They know something about Him. Most people we encounter consider themselves one type of Christian or another. Why is it we see the same problems Jesus experienced? “So the crowd was divided about him.” This about sums up what Jesus experienced as well as what many of us, soldiers of Christ experience when we enter that spiritual warfare. Life is not easy. We know finding someone who wants to learn, who wants to dedicate themselves to understanding is rare. I wish there was an easy answer. If there was one, I’m sure John would have recorded it. But look at John’s life. He spent his last days exiled on an island. Not just any island but one the Romans dumped the worst criminals. A barren wasteland where life was difficult to say the least. No one cared if those prisoners on that island killed each other off. Talk about needing protection. John needed God’s protection everyday. That’s where God gave John a vision of a better life. He needed it more than anyone. 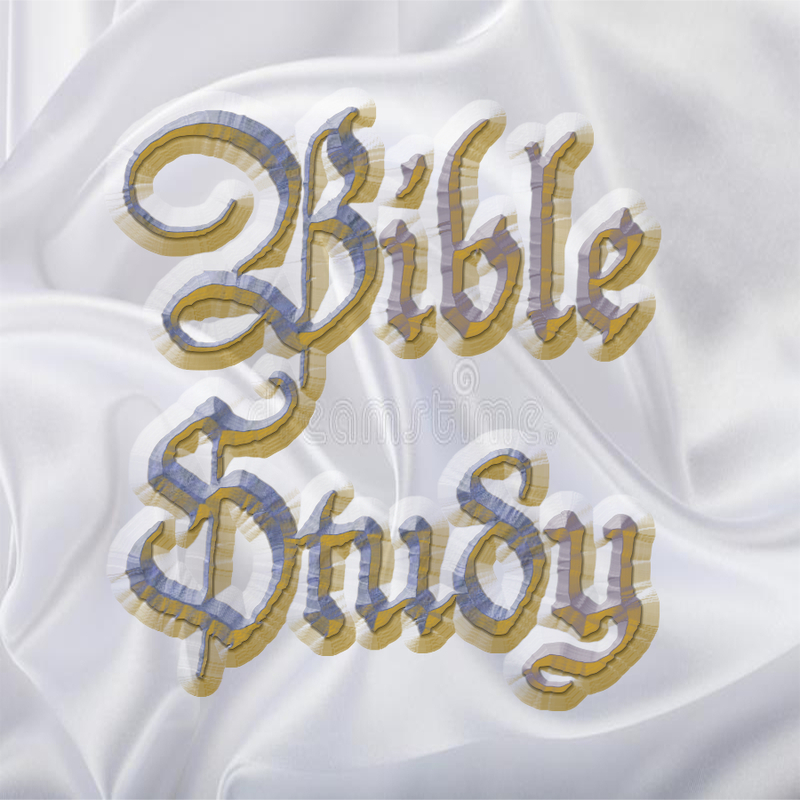 John 7:45-52 NLTse When the Temple guards returned without having arrested Jesus, the leading priests and Pharisees demanded, “Why didn’t you bring him in?” (46) “We have never heard anyone speak like this!” the guards responded. (47) “Have you been led astray, too?” the Pharisees mocked. (48) “Is there a single one of us rulers or Pharisees who believes in him? (49) This foolish crowd follows him, but they are ignorant of the law. God’s curse is on them!” (50) Then Nicodemus, the leader who had met with Jesus earlier, spoke up. (51) “Is it legal to convict a man before he is given a hearing?” he asked. (52) They replied, “Are you from Galilee, too? Search the Scriptures and see for yourself–no prophet ever comes from Galilee!” (53) Then the meeting broke up, and everybody went home. It didn’t look good for the temple guards sent to arrest Jesus when the returned empty handed. Those guards are some of the few people who listened to Jesus. We can see God’s hand in protecting Jesus. The Pharisees were not happy at all. They made fun of the guards, asking how they could have been deceived by a man all the religious leaders could see through. That was the third time Jesus’ birthplace was brought up. Or shall we say, where He came from. Jesus never claimed to be born in Galilee. At least we can see the Pharisees knew where the Messiah was born according to prophecy. John wanted to leave the hint, they knew prophecy told the Messiah was to be born in Bethlehem. But notice how the Pharisees refused to speak the name of the city. It is their way of showing they don’t agree with, or want to avoid a subject. They’re displaying their human nature – which is a hard thing to figure out. If there was an easy way to reach people, John would have recorded it. Instead, John gave us a list of conflicting personalities. Notice how John concentrated on personalities that opposed Jesus. Look at the variations. Do we learn anything from them other than the fact, there are a lot of reasons and excuses people don’t want to listen to Christ, much less follow Him. Then we have to consider the fact, Jesus’ disciples didn’t understand much about the plan of salvation until a major portion of it was fulfilled. Maybe that’s recorded to show all of us have problems listening. We all make mistakes. We all have a lot to learn. The disciples experienced a time when they thought they knew enough. They had their moments when they thought they didn’t have to listen, or didn’t want to listen. At least they were man enough to record their mistakes instead of covering them up. They recorded their mistakes for us to learn from. Are we?